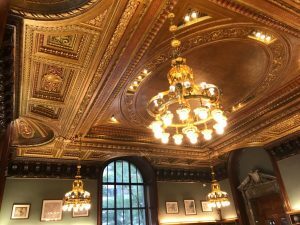 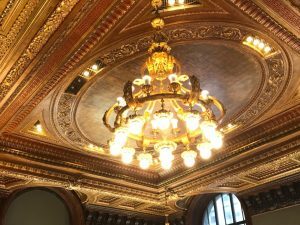 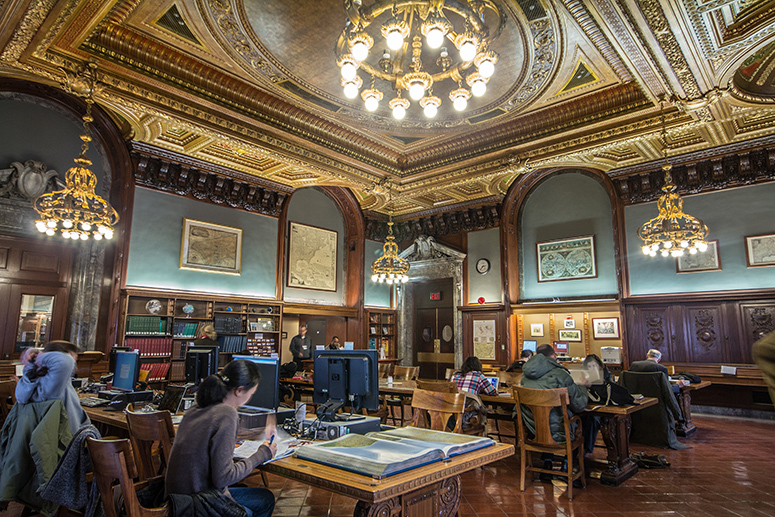 The New York Times described the newly restored ceiling of the Maps Division as, “a ceiling that has been likened to an inside-out Faberge egg.” Ernest Neuman Studios played a significant roll in the Library’s first restoration of The Maps Division since it was opened in 1911. 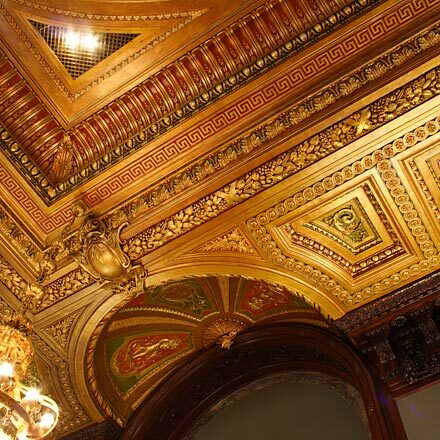 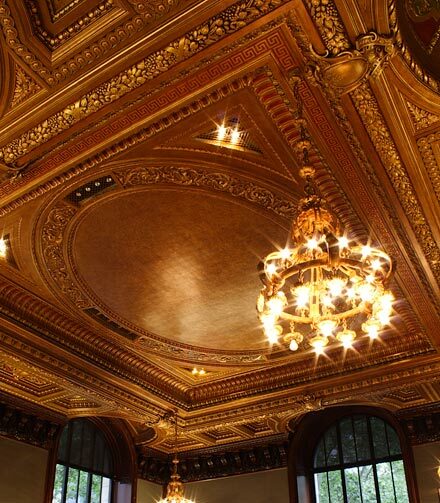 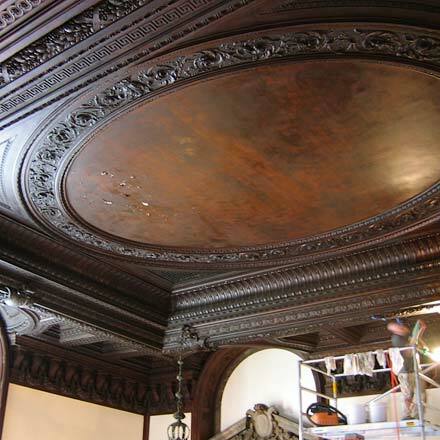 The focal point of this project was the restoration of the ornate 20-foot plaster ceiling. 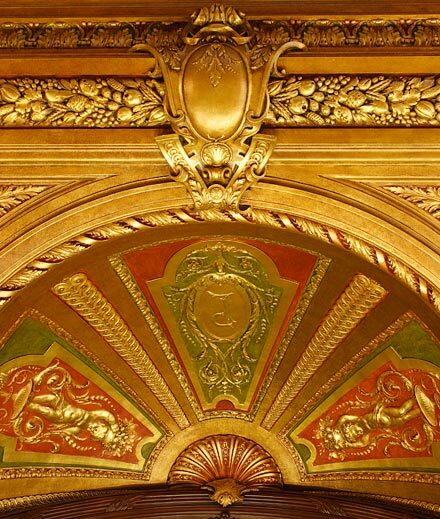 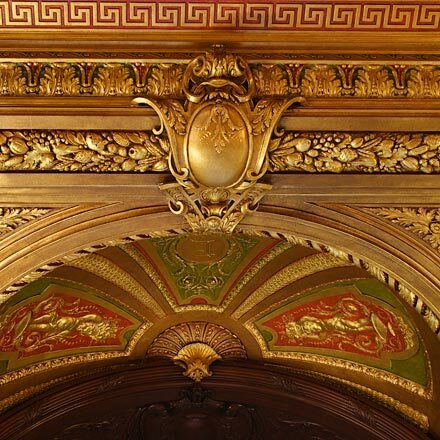 The large oval at the center of the ceiling, finished in composition gold leaf, is flanked on all sides by molded ornaments such as recessed domes, cherubs, demons, foliate designs, seashells and garlands. 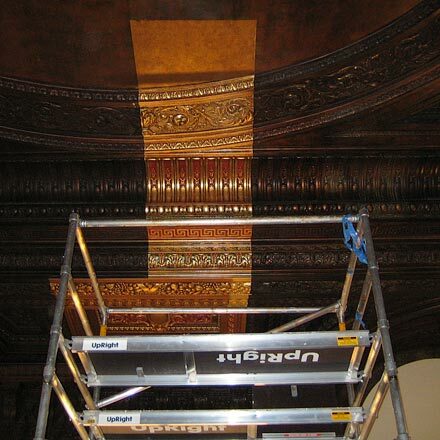 Once the ceiling was accessed with scaffolding, a historical paint analysis was conducted to determine the ceiling’s original paint colors and finishes. 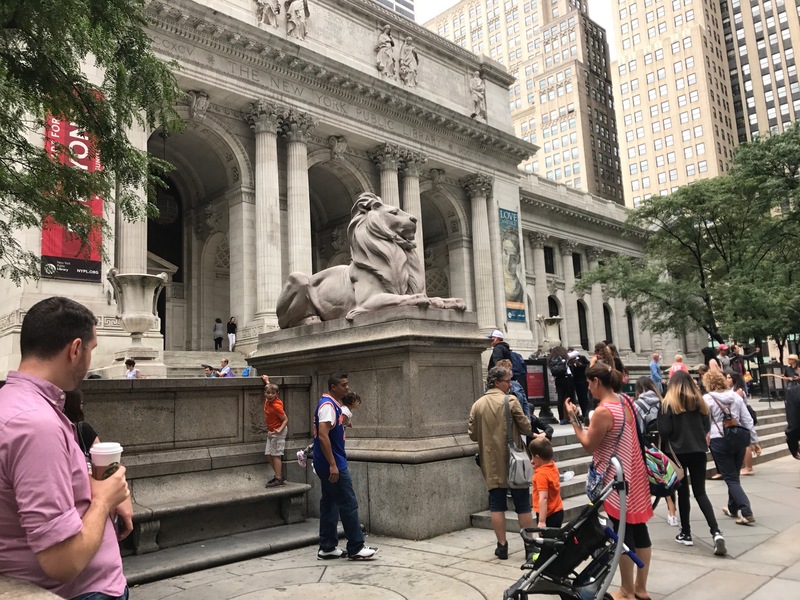 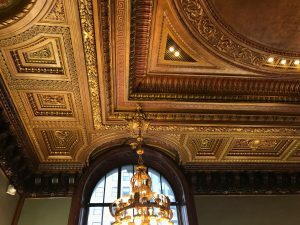 The ceiling was covered in a dense layer of soot and grime from years of Fifth Avenue traffic and bus fumes drifting in from the street level windows. 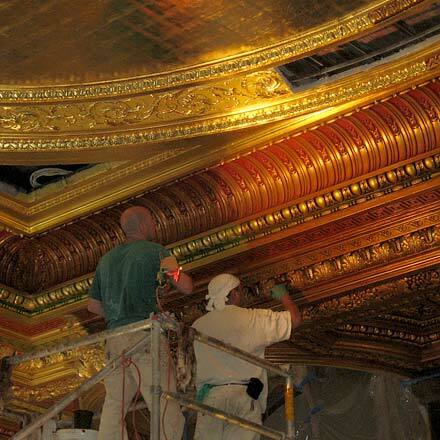 We further discovered that the composition gold leaf had oxidized overtime and turned a dark green-brown. 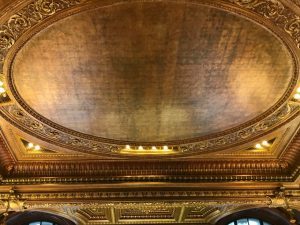 The varnish and glaze had also darkened and clouded over time, leaving the entire ceiling finishes dull, dark and hazy. 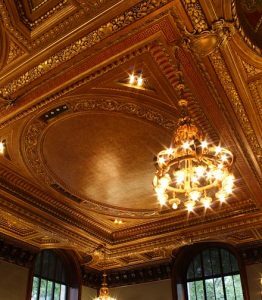 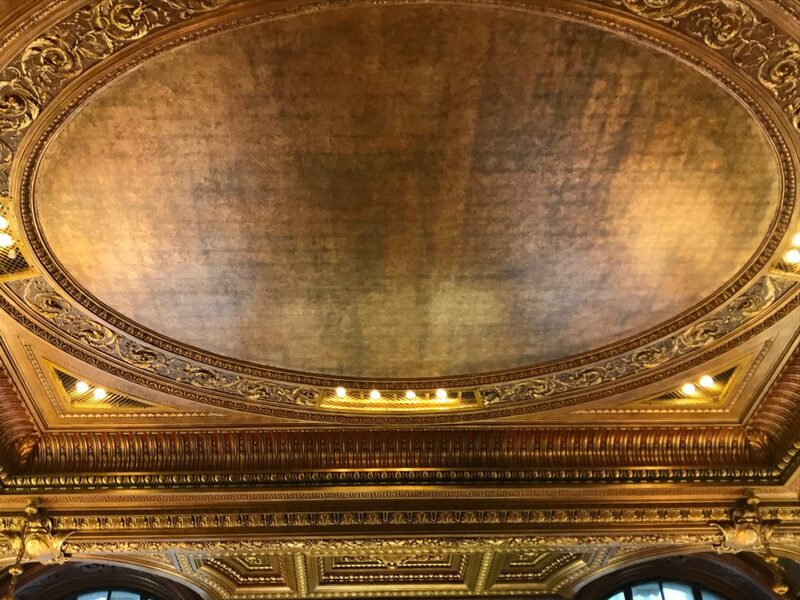 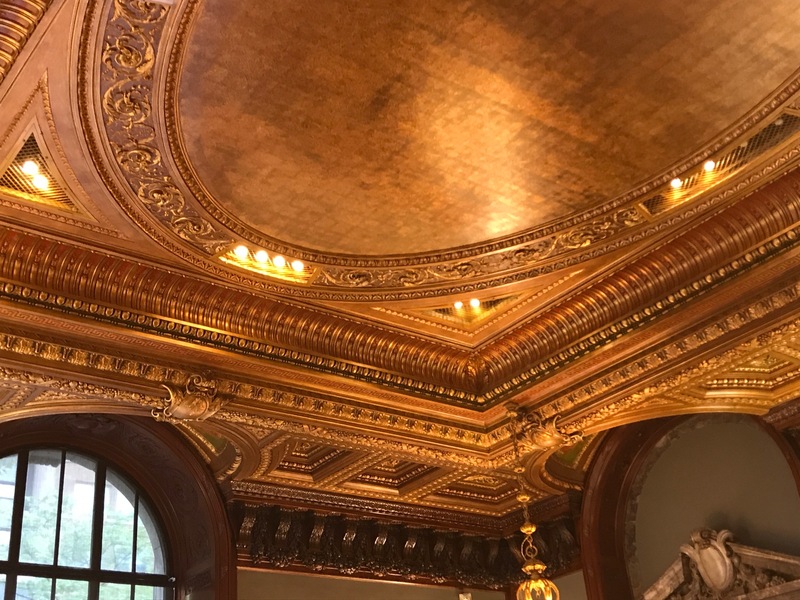 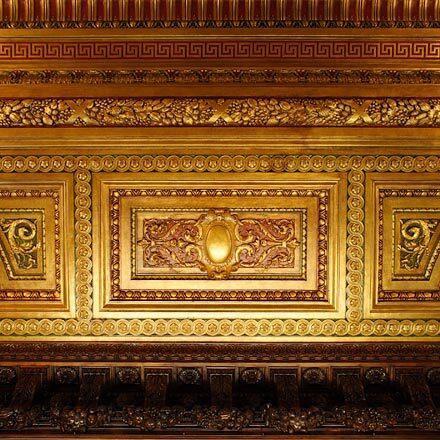 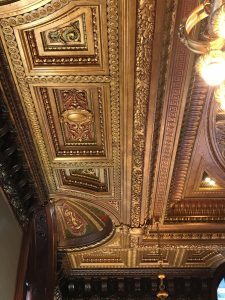 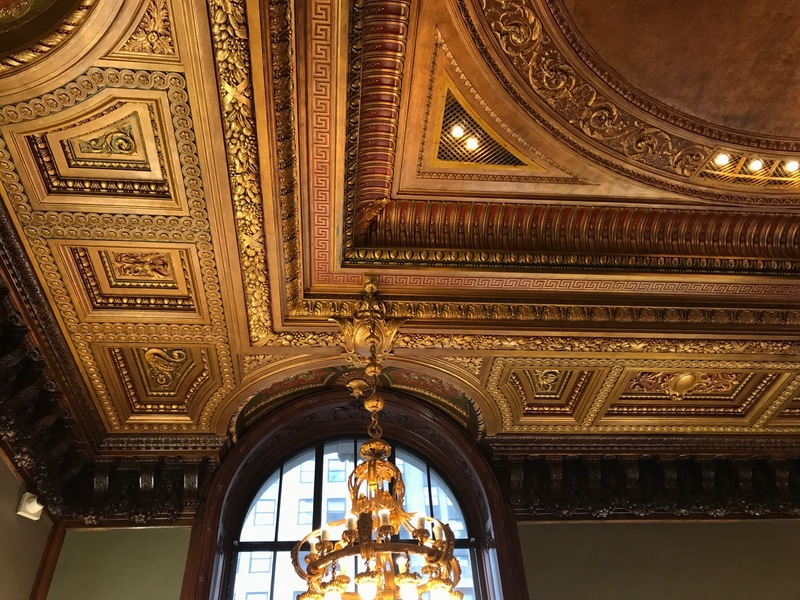 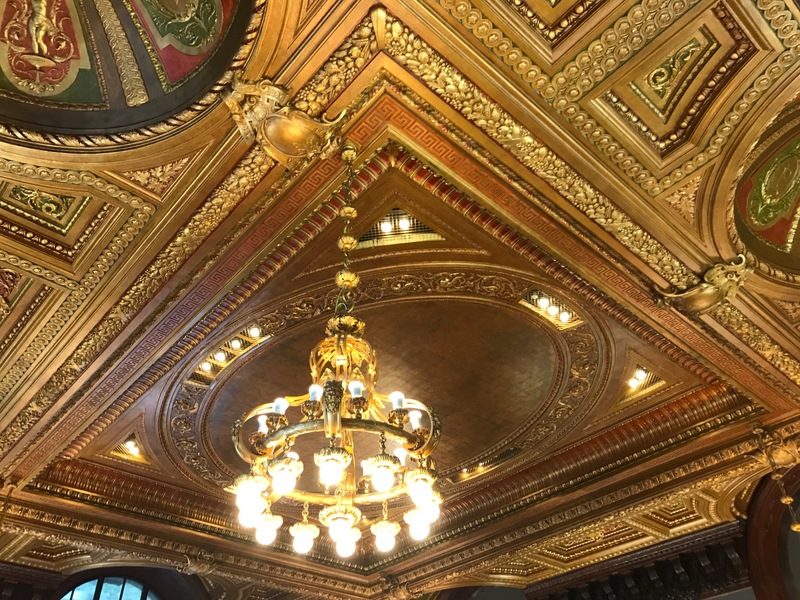 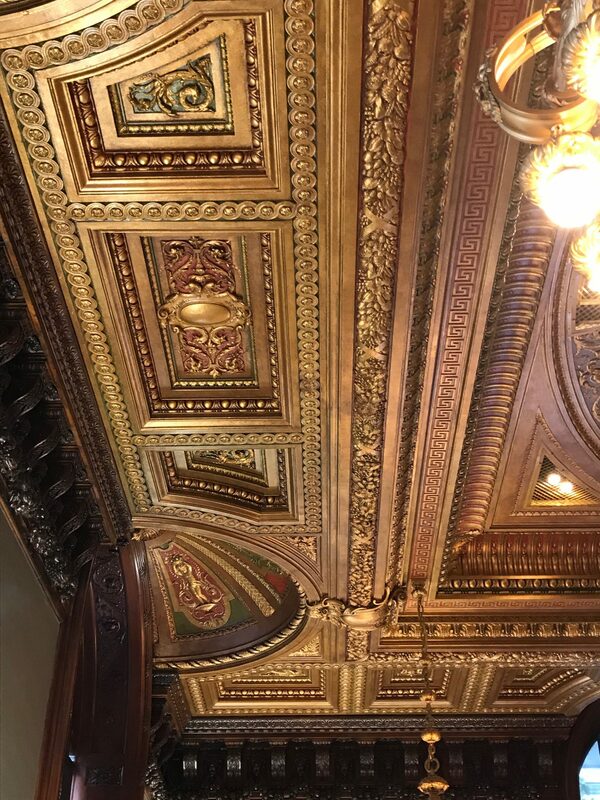 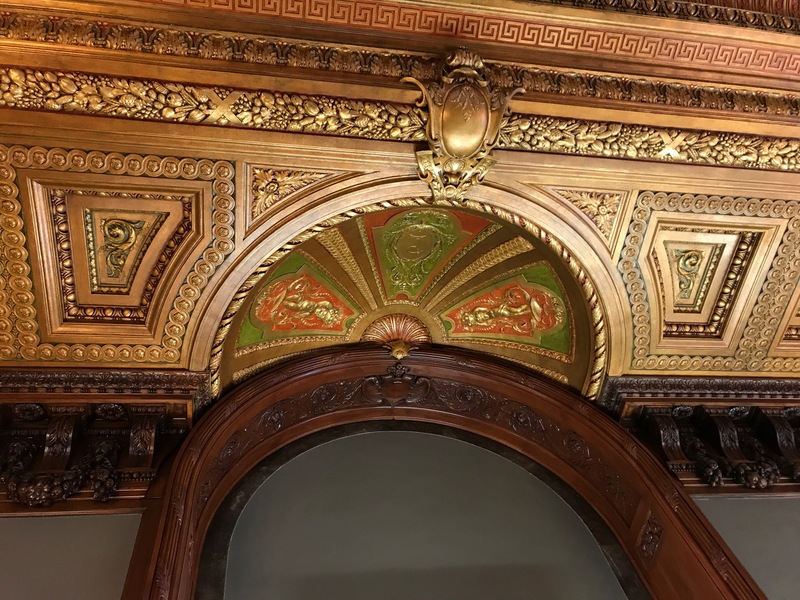 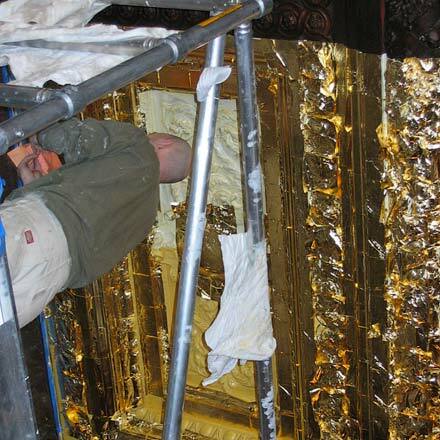 ENS created a mock up area on the ceiling matching the original composition gold leaf base and applied transparent tinted glazes onto the gold – matching the look of the ceiling’s original 1911 finishes. The libraries restoration committee and the architect approved the mock up and we restored the entire ceiling back to its original and intended grandeur.